Vanderbilt researchers are launching satellites into space to test the radiation effects on electronic components in order to predict and prevent future failures of such devices. Funded by NASA, these radiation effects test bed payloads will be among the first of their kind in the United States at their scheduled launches in 2013. It’s an opportunity to test the billions of calculations conducted on the ground in computer simulations at Vanderbilt’s Institute for Space and Defense Electronics (ISDE). But more than that, it’s a chance to introduce a new generation to the exciting discoveries where electrical engineering and computer science intersect with space exploration. Undergraduates are working with ISDE engineers to design and build the payloads. Researchers also are reaching out to high school and middle schools in Tennessee to excite a younger generation about engineering, space exploration and electronics. The team, led by Vanderbilt professors Robert Reed and Robert Weller, will begin by selecting teachers and classes with whom to work. One plan calls for the younger students to actually man ground stations where they can log in and collect scientific data beamed from the spacecraft. A web cam set up in the development lab will showcase for the students how their data is analyzed. In space, electronic devices are constantly bombarded with radiation, which can cause certain parts to fail or behave in unexpected ways. Engineers are finding that some devices are failing more often as nanotechnology has driven devices to be made with smaller and smaller components. While the smaller components make them lighter and faster, they also make them more susceptible to random radiation events. It’s important to be able to predict when, why, and how components of a spacecraft might fail so that engineers can fix or override potential problems. “In space, devices are subject to bombardment by cosmic rays, elements varying from hydrogen to iron and beyond, coming from all directions at the same time,” explained Reed, professor of electrical engineering. Experiments on the ground use atom smashers, but those produce only one type of radiation in one pencil beam, allowing researchers to physically test only one condition at a time. This type of radiation-effects research is equally important for devices on the ground. While the earth’s atmosphere generally protects us from exposure to too much radiation from space, a few cosmic rays get through, and these can affect ordinary devices like computers and cell phones. The cosmic rays interact with air molecules and produce daughter particles like neutrons and muons, a kind of heavy electron that lives only about two millionths of a second. Up until now, because transistors have been large, muons have not been able to deposit enough energy to have an impact on electronic devices. However, today’s parts are smaller and require less power, so they are vulnerable. What might that mean to regular people? Researchers are predicting far more occurrences of “the blue screen of death,” that awful moment when your computer dies and you’re confronted with just a swirling icon. If those potential failures can be predicted by experiments on the ground and in space, electrical engineers can work to fix them. “It’s important to understand how these components will work in space. We just need to know the failure modes so designers can design around them,” Reed explained. Vanderbilt currently has four missions planned based on the CubeSat platform. A CubeSat is a small, square, miniaturized satellite, only 10 cm on a side. 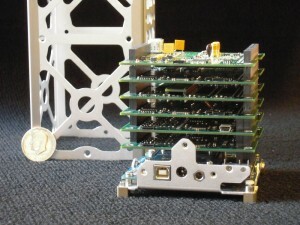 A single 10 cm CubeSat is a 1U. Several CubeSats can be stacked together, making 2U, 3U, or more. The first mission, named Commodore, will integrate a Vanderbilt-developed payload with a spacecraft being built by a St. Louis University team. The planned launch date of this mission is summer of 2013. The second mission, named Independence, is a 2U satellite developed solely by Vanderbilt. This mission contains three experiments and will be launched in winter of 2014 to an altitude of ~500 km for a duration on 1 year. The third mission, named VUIcan, is a 1U satellite developed in conjunction with the Radio Amateur Satellite Corporation (AMSAT-NA). The launch date for this mission is scheduled for the spring of 2015. A fourth mission which has yet to be names will be launched in 2016. Launching CubeSat missions is not new. So far, most CubeSat work has been focused on education. What’s new is that Vanderbilt researchers can focus on both education and actual hands-on testing with these missions. CubeSats are launched as secondary payloads on rockets that are primarily intended to launch other larger spacecraft. When the rocket reaches a certain pre-determined location, its sends a signal and the CubeSats are launched on their separate missions. They are, so to speak, diminutive cosmic hitchhikers. 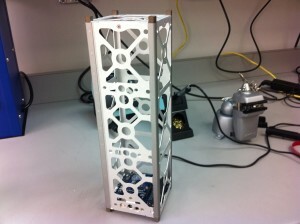 “We can build a CubeSat payload in less than a year and for just about the cost of testing the parts on the ground. The overall goal is to validate our computer simulations, which is impossible to do using conventional radiation sources,” said Weller, who is also a professor of electrical engineering. Recently, the government has been retrofitting systems to launch these education-oriented, cost-efficient CubeSats. “Because of this emerging interest in small spacecraft, there are a lot of good opportunities for us to get rides to space,” Reed said.